The name Banavasi is derived from the words (Bana means forest and basi means spring). In the ancient time the place was known by other names as Jayanti, Vaijayanti, Sanjayanti and Kanakapura (not the Kanakapura near Bengaluru). The now sleepy village Banavasi was the rich capital of a mighty Kadamba Dynasty. This dynasty was the first royal one of Karnataka. The Empire of Kadamba was established during the 3435 AD. The village is on the banks of the River Varada. This place is located on the border of the Districts of Uttara Kannada and Shimoga. The village is sleepy now but it has a rich past being the grand capital of the first and one of the mighty royal dynasties of Karnataka. The main attraction of this place is the Madhukeshawara temple. This temple is built during the rule of the Kadamba Dynasty and the temple will give a glimpse of the grandeur of Kadamba architecture. The place has Buddhist and Jain influences in the olden days. 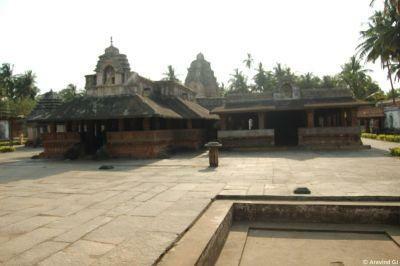 The old Banavasi is about a kilometer away from the present village and the same is having 2 – 3 old temples. Hardly anybody visit the place during the trip to Banavasi. It is believed that the Vijayanagar kings had been patronizing the Madhukeshawara temple. Eminent Kannada poet wrote his poems here. 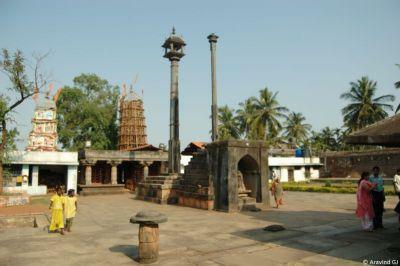 The Madhukeshawara temple, dedicated to Lord Shiva was built for the worship of the mighty rulers of Kadamba dynasty. After building the temple, there were additions, alterations and renovation by the later dynasties who occupied the seat of power of the area. Hence it is a mixed blend of various styles of architecture. Due to the passage of time, weather, neglect and vandalism it is not having the grandeur it had once. The temple is built in a vast area as was the custom of those days. The sprawling compound houses several structures of the temple complex with different architectural styles testifying to the various dynasties which ruled the area. The sanctum sanctorum is a plain and simple structure without any carvings except only for a little on the lintel and door. This might have been built by the Kadamba Rulers. But one can witness the remains of the Hoysala architecture with its incredible carvings on the pillars and ceiling in the Nritya Mantapa (Dance hall)and the Chalukya style in the Sankalpa Mantapa, and also the Sonda Rulers' exquisite carving of the monolithic (huge, massive e walled) structures. What is left of the ravages is the grand old temple of Madhukeshawara temple. The temple was completed in the 9th century. At the top of stairs to the entrance there are 2 images o f carved elephants. As one enters the huge temple courtyard the dwajasthamba is seen standing tall. 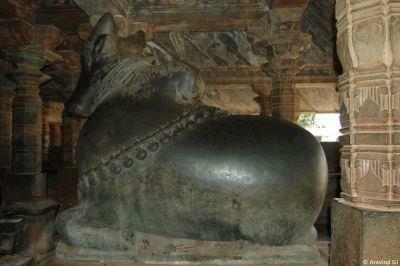 In the main temple there is huge 7 feet black single stone carved Nandi idol is installed facing the sanctum. As the name suggests the presiding deity is the Madhukeshawaraswamy in the sanctum sanctorum. The idol is in the form f a honey colored lingam. It was consecrated during the ruling period of the 1st King of Kadambas Mayura Varma. The temple is having other deities of Lakshminarasimha and Parvathi Devi. The outside wall of the temple has the carved decorative panels depicting Ganesha, Brahma, Vishnu, Maheswara and Mahishasura Mardhini. 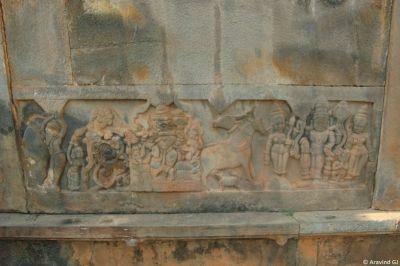 The gopura of the temple is having the figures of various gods and goddesses. For the entry of light and air there are stone lattice windows on the outer walls. There is a small pleasing garden in the compound. There is a stone cot delicately carved fixed outside of courtyard. The cot is supposed to have been made about 1500 years back and was used by the kings. It is worth seeing this as it is an artistic evidence of the ancient art in stones. It is fully decorated with carvings. The co is in an enclosure for protection from vandals and tourists. On the Ugadi day the temple jatre will be held with an ancient wooden chariot which is a major attraction. It is believed that this chariot was donated by the Sonda king in 1608. The jatre consist of the grand procession with the chariot drawn through the broad street in front of the temple. The utsava murthis are carried in the chariot during the jatre. On all other occasions a smaller chariot of the temple is used. Another festival is Navarathri when the idol of Devi is decorated with different dresses on each of the nine days. As the name suggests this is a 9 day festival. Apart from the temple festivals one major event is the yearly Kadambotsava in December attracting large number of visitors. For this event various troupes will be performing yakshagana, music, folk dances, art exhibitions and many other cultural activities. People from all over the sate and from all over south India participates and performs in this event. It is also attended by literary and other well known personalities. It is believed that the legendary dancer Shanthala challenged the musician Allama Prabhu and made an inspiring and excellent performance. It I believed that till today no one could do a performance better than that. She became famous and was married by king Vishnu Vardhana, the first king and founder of the Hoysala dynasty. She is the inspiration and model for the world famous dancing sculptures on the Halebeedu and Belur temple walls. The legend also has it that Vishnu Vardhana was originally a Brahmin by name Mayura Sharma. He was studying in Kancheepuram. During his stay there he was humiliated by the Pallava princes. Then he took up the study of warfare of the Kshatriyas. With this training he became a valiant king and established the Kadamba dynasty, the earliest royal dynasty of Karnataka in 345 AD. Air – Hubli is the nearest airport at 120 kms. Rail - Shimoga is the nearest railway station which is 112 kms away. Road - The nearest center is Sirsi which is 23 km away from Banavasi. Banavasi is 374 km from Bengaluru and is connected via Sirsi. Banavasi can be visited during any period of the year but heavy rains can be expected during the monsoon seasons. Best time to visit is October to March. There may not suitable accommodation found in Banavasi and it is better to make day trips. The STD code of Banavasi is 08384.